Rwanda is best known for Mountain gorilla safaris. Rwanda's gorilla safaris are easily combined with a Tanzanian or Kenyan wildlife safari. Affordable Rwanda Tours and Gorilla Safaris? Rwanda is best known for Mountain gorillas, the most endangered of all the gorilla species, which live on the forested slopes of the Virunga Mountains in the country's Parc National des Volcans. The Virungas extend through Uganda and the Democratic Republic of Congo as well, but fortunately for Rwanda, half of the remaining populations of Mountain gorillas live within its borders. There are 10 habituated Mountain gorilla families open to tourism in Volcanoes National Park which means 80 trekking permits a day are available. Volcanoes National Park is quickly accessible from Kigali, the capital, in just two + hours by road. This means you can arrive in Kigali no later than midday and be at the park by mid to late afternoon, ready to begin your trek the following morning. 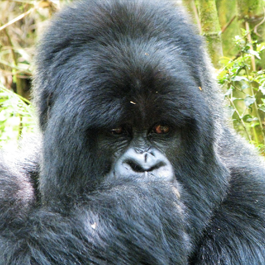 These factors, along with Rwanda's competent handling of tourism overall, makes gorilla trekking in Rwanda a popular choice. Rwanda is an especially easy destination to combine with a Tanzania wildlife safari. There are direct flights between Kilimanjaro International and Kigali, more flights per day through Nairobi. 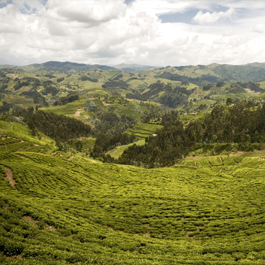 Although most travelers visit Rwanda for only the gorillas, Rwanda has more to see. Akagera National Park contains the typical wildlife of the African savannah, although not in the same numbers. Nyungwe Forest is the largest untouched montane forest left in Africa. Winding trails and waterfalls make it a wonderful place to hike, bird watch, and encounter primates other than gorillas, such as Colobus monkeys and chimpanzees. The source of the Nile is found in Nyungwe Forest too. Lake Kivu on the borders with the Democratic Republic of Congo has breathtaking scenery. Surrounded by terraced slopes of farmed plots, the lake is the place to relax and enjoy boat trips, water sports and swimming. Several options are available to combine a Mountain gorilla safari in Rwanda's Volcanoes National Park with destinations in the Eastern Democratic Republic of Congo. Using Goma, DRC, as a base, easily reached from the Rwanda border town of Gisenyi, you will need two nights/three days to climb and descend the Nyiragongo volcano. Goma is a perfect base for a one day trip to Kahuzi-Biega National Park in the DRC for an Eastern lowland gorilla safari. Consider 10 days if you include everything - Volcanoes National Park and Lake Kivu in Rwanda with Kahuzi-Biega National Park, Mount Nyiragongo and Virunga National Park in the DRC. We provide itineraries for any destination in Rwanda. MTT is a small company, the advantage of which is quick decision-making ability, room for lots of flexibility, and personalized service. 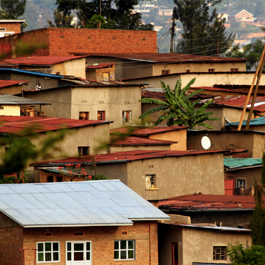 Broad experience and knowledge of more than one African country makes MTT a qualified consultant for anyone seeking to combine Rwanda with other countries. 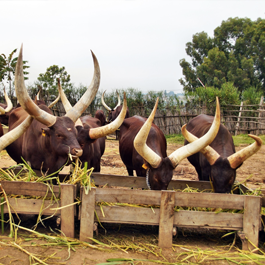 Rwanda has a diverse range of accommodations suitable for different budgets and tastes. The final cost of a safari depends upon many factors: length of the safari; accommodation choice; seasonal rates for accommodation; safari vehicle rental; fuel; driver and guide expenses; local flights; airport transfers; and park, community and activity fees. Operators which offer set departures and itineraries which don't alter greatly throughout the year can provide safaris already priced on their websites. MTT's specialty is bespoke safari services. 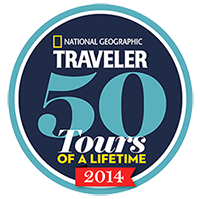 Each itinerary is personal and its cost varies. However, the guideline for a good value, mid-range safari in Rwanda is 375 - 600 USD per person per day.